Snow! And the leaves have only just fallen! We knew it was coming early this year. At least we suspected it. There were even some flurries that didn’t stick a few weeks ago. Last night the weatherguessers said there was a chance of flurries during the night, but the weather has been so erratic, that they haven’t been right 24 hours in advance often enough to give that much credibility. But upon waking up this morning and glancing out the window, there it was. Of course, this being Maine after all, early snows are not unheard of. Before moving here we were visiting in late October one year and there was a large snow – several feet, in fact. But that was in the mountains, not near the coast. So this is a bit different, for us, anyway. Here it is all the same. 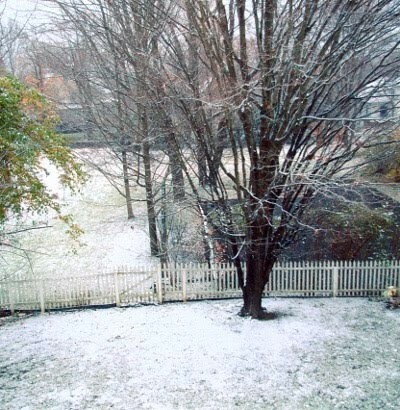 The photo shows our back yard, looking down from the second floor of the house, about 7:00 a.m. today. The snow is continuing to fall, making the prediction of “possible accumulations of up to an inch” look quite likely. This is predicted (!) to stop this morning, with possibly a bit more this afternoon, but the high temperatures are in the mid-40’s, so it isn’t likely to stick around long. And the snow removal here is unbelievably quick and thorough, so we normally have no trouble with snow on the roads. Still, all this early winter weather makes it likely that the snowshoeing and cross-country skiing (all within only a few minutes drive of Brewster House) will be excellent this year! Are you planning to visit?